← Carol is Teaching A New Ink Painting Course! I received the following article from Patricia Cota-Robles over a week ago and I received my copy of this work as well. Today I was able to listen to the CD’s. Rather than predispose anyone to expectations about the CD’s, suffice it to say that my experience of them is that they strongly affected me . I also would like to give myself time to integrate the energetic changes that occurred before I speak more about the work. I highly recommend this to anyone who would like to tangibly experience Patricia Cota Robles at her best. I found it to be profoundly and positively altering. Through the unified efforts of Heaven and Earth, we have successfully birthed a Renaissance of Divine Love on this Planet. Now, through the unprecedented Solar frequencies of Transfiguring Divine Love which are flowing into the mental and emotional strata of Earth, every person’s I AM Presence is initiating the process of transforming our carbon-based bodies into Crystalline-based Solar Light Bodies of Infinite Perfection. This is a critical factor in our Ascension process. At this very moment, there is a Divine Alchemy occurring within the physical, etheric, mental, and emotional bodies of each and every one of us. This Divine Alchemy is occurring at an atomic cellular level not only within Humanity’s bodies, but in the physical, etheric, mental, and emotional strata of Mother Earth as well. It is hard to fathom what the success of this phase of the Divine Plan will mean for Humanity, but the Beings of Light said it will enable us to reverse the adverse affects of our fall from Grace. These affects include the aging of our bodies, disease, degeneration, mental and emotional illness, and even death as we know it. These affects also include poverty and lack and limitation of every kind, inclement weather conditions, plagues, famines, and pestilence. All of which have perpetuated the maladies of war, greed, the abuse of power, and immeasurable pain and suffering for both Humanity and Mother Earth. The prophets of old told us about a future day on a New Earth when there would be no such thing as poverty, war, disease, aging, or any of the other gross mutations that Humanity miscreated either deliberately or inadvertently after the fall. What they did not tell us is how this transformation would occur. That is because the process involved was beyond the comprehension of their 3rd-Dimensional finite minds. Consequently, people began to surmise how Earth’s miraculous transformation would occur. Because we had been manipulated by our human egos into believing that we were worthless sinners and worms in the dust, we came to the erroneous conclusion that the only way such an event could happen is if someone came and saved us. The problem with that theory is that Humanity created the maladies existing on Earth through the misuse of our creative faculties of thought and feeling and our gift of free will. Therefore, we alone are responsible for transmuting those human miscreations back into Light. Not even our Father-Mother God will interfere with our free will choices. There have been wondrous Adepts and Avatars who have come to show us the path of Divine Love that will lead us through this transformational process, but NO ONE can do this for us. The entire Company of Heaven is standing in readiness awaiting the opportunity to help us, but they cannot intervene without our permission. Once we make the Heart Call and ask for their assistance however, the floodgates of Heaven will open and the Beings of Light will amplify our efforts a thousand times a thousandfold. Now, as we move toward the quantum shifts up the Spiral of Evolution that will take place December 12, 2012—12:12:12, and December 21st, 2012—the December Solstice, the Beings of Light in the Realms of Illumined Truth are revealing to us the greatest need of the hour. The Divine Plan is that now, since a Renaissance of Divine Love has been birthed on Earth, we have the potential of Ascending into frequencies of the 5th Dimension that will transcend our Human miscreations. This means that with the influx of Light that will occur during the celestial alignments in December, the Earth and all Life evolving upon her have the capability of transforming our physical realities much, much sooner than what seems possible from outer appearances. The Company of Heaven said the KEY to this greatly accelerated Transfiguration involves two things. The first is Humanity’s willingness to consciously and deliberately participate in the Divine Alchemy of transforming our carbon-based cells into the crystalline-based cells of our Solar Light Bodies. The second thing we have to accomplish is more complicated. That critical facet of the Divine Plan involves assisting Mother Earth with the Divine Alchemy of transforming her carbon-based cells into the crystalline-based cells of her Solar Light Bodies. This can only be accomplished by healing the schism that still exists to some degree between Humanity and the Elemental Kingdom. The Elemental Kingdom is the Divine Intelligence within the primal Light substance that forms the earth, air, water, fire, and ether elements that make up ALL physical matter, including our four Earthly Bodies and those of Mother Earth. Most of Humanity does not even realize that there is Divine Intelligence in matter. In fact, millions of people are still functioning with the distorted belief that our fragmented and fear-based human egos conjured up. That is the belief that the Earth is an inanimate object that is to be used and abused as Humanity chooses. The deadly problem with that belief is that NOTHING COULD BE FARTHER FROM THE TRUTH! All over the world we are painfully experiencing the results of that erroneous thinking. All we have to do is observe the dramatic events taking place involving the weather: pollution, droughts, famines, earthquakes, volcanos, hurricanes, tornados, wild fires, tsunamis, floods, typhoons, and all other expressions of inclement weather that are wreaking havoc in people’s lives. The Elemental Kingdom is responsible for outpicturing Humanity’s thoughts, feelings, words, actions, beliefs, and behavior patterns in the physical world of form. The Divine Intent of this selfless service is to allow us to experience in a tangible way the results of what we are cocreating. This means that what is occurring on Earth at this time in relation to the elements and the physical, etheric, mental, and emotional strata of Mother Earth is merely A REFLECTION OF HUMANITY’S CONSCIOUSNESS. The HOPEFUL news is that since that is the case, you and I and the rest of Humanity have the ability to change the negative things that are occurring on Earth. This can be easily accomplished by changing what we are cocreating through our thoughts, feelings, words, actions, beliefs, and behavior patterns, in other words, by raising our consciousness. Since time is short and the need is great, the Company of Heaven is asking embodied Humanity to redouble our efforts and to intensify our Lightwork. To help us remember the sacred knowledge we all clearly understood prior to this embodiment, the Beings of Light have compiled a complex overview of how Humanity lost awareness of the Elemental Kingdom and what we must do to heal that relationship. In this amazing overview they also reveal the incredible Divine Intervention that has taken place over the past few decades in order to remind awakening Humanity about these Beings who have so selflessly volunteered to assist us in learning to be cocreators during our Earthly Sojourn. The Company of Heaven also clearly reveals the profound Truth that our Ascension into the 5th-Dimensional Realms of Infinite Perfection cannot occur without Humanity’s cooperation with the Elemental Kingdom. The Beings of Light are also giving us powerful visualizations and activities of Light that will allow us to consciously and deliberately participate in the Divine Alchemy of transforming our carbon-based cells into the crystalline-based cells of our Solar Light Bodies. All of this information is flowing into the mental and emotional strata of Earth and is readily available to anyone who is willing to lift up in consciousness and listen to his or her heart. Ask your I AM Presence to reveal to you your part of this Divine Plan and respond according to your Heart’s Call. In addition to our individual endeavors in this exceptionally important facet of the Divine Plan, we are being asked to serve as surrogates on behalf of our sisters and brothers around the world who are so buried in the painful circumstances of their lives that they cannot raise their heads above the negativity enough to perceive the urgency of the hour or the need to invoke the Light for themselves. The wonderful thing about volunteering to serve as a surrogate on behalf of ALL Humanity is that there is no separation! Consequently, every call we make for our sisters and brothers effects our own lives in powerful and positive ways. As we are lifted up they are lifted up, and as they are lifted up we are lifted up. This is truly a win-win situation of the greatest magnitude. For more than 40 years the Legions of Light in the Realms of Illumined Truth have asked those of us associated with the New Age Study of Humanity’s Purpose to document, for the benefit of all Humanity, the information being given to us from On High. We have made this information freely available to anyone who is interested through decades of free classes and myriad meditation groups. We also share this information without charge through our website, our monthly e-mail newsletters, free seminars, a weekly radio program, webinars, teleseminars, and YouTube presentations. In addition to all of the things we offer for FREE, the Beings of Light have asked us to also produce CDs, DVDs, Books, MP3s and Celestial Art that will help people to add to the Light of the world in additional ways. The Beings of Light explained that the advantage of thousands of people listening to the same CD and invoking, in exactly the same way every time, the powerful tools, visualizations, information, meditations, and affirmations they have given to Humanity the thoughtforms being invoked build in momentum quickly and exponentially. Of course, our individual invocations are also powerful, but if thousands of people are doing their own thing and each one is giving a different variation of the invocations, the thoughtforms change every time and they are not able to build in momentum as quickly, as powerfully, or as effectively. For this reason, the Company of Heaven has requested that we make a set of two CDs available for anyone who is interested in assisting Humanity with the two critical facets of the Divine Plan that reflect the greatest need of the hour between now and December 21, 2012, according to the information from On High. The first CD contains the amazing overview from the Beings of Light that is designed to help us remember the sacred knowledge of how Humanity lost awareness of the Elemental Kingdom, and what we must do now to heal our relationship with these selfless servants of Humanity and our Father-Mother God. This CD also addresses the critical facet of the Divine Plan that is necessary in order for us to assist Mother Earth with the Divine Alchemy of transforming her carbon-based cells into the crystalline-based cells of her Solar Light Bodies. In addition, it reveals the amazing Divine Intervention that has taken place, up to this point, to heal the schism between Humanity and the Elemental Kingdom. 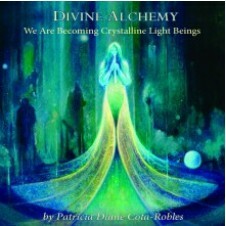 The second CD contains very powerful invocations, meditations, visualizations, and other activities of Light that will help each of us to consciously and deliberately participate in the Divine Alchemy of transforming our carbon-based cells into the crystalline-based cells of our Solar Light Bodies. As we God Victoriously accomplish this for ourselves, we will simultaneously assist the I AM Presence of every man, woman, and child to do this for themselves in alignment with his or her Divine Plan and the highest good for all concerned. Because of the importance of this phase of the Divine Plan, the Beings of Light asked me to record these two CDs on June 5, 2012 during the last phase of the Venus Transit. I did just that with the Divine Intention of encoding the powerful frequencies of Divine Love from the Venus Transit into every word recorded on the CDs. The Company of Heaven asked us to make these CDs available AFTER the successful birthing of our Renaissance of Divine Love. That way, the I AM Presence of every person on Earth would be capable of integrating the influx of Light from the powerful tools and information encoded on the CDs. If you have the Heart Call to serve as an Instrument of God on behalf of ALL Humanity, as well as Mother Earth and ALL Life evolving upon her, these CDs are now available on our website. You may download them as MP3s or order the physical CDs and we will mail them to you. You may also order the CDs by mailing or faxing in the order form at the bottom of this e-mail. KNOW that every time you listen to these CDs you are weaving your magnificent Light into the building momentum of this powerful thoughtform and exponentially expanding this vitally important facet of the Divine Plan. In unison with Lightworkers around the world, you will clear the way for the awesome events that are destined to take place in December 2012. This is a Cosmic Moment for which we have all be preparing for myriad lifetimes. Listen to your heart and your I AM Presence will guide you unerringly to your part of this amazing Divine Plan. This entry was posted in New Age Study of Humanity's Purpose, Patricia Cota-Robles, www.eraofpeace.org and tagged 2012, Energy Healing, New Age Study of Humanity's Purpose, Patricia Cota-Robles, www.eraofpeace.org. Bookmark the permalink. May I pay my share, borrow it, and make a copy ? I hope you enjoyed your holidays and fast. Certainly Dear Carol. Do give me a call to arrange this.